Rather appropriately, as I am now on the last ‘lap’ of choosing artworks for the sporting exhibition (cue name change of exhibition to Playing for Scotland: the Making of Modern Sport), it is now time for the sport of athletics to relay the baton and reveal the story of Scots whose names live on today as giants (literally giants) of the sport and its associated disciplines. Let’s start with Donald Dinnie (1837-1916), the first sporting superstar, seen here above. Dinnie, from Aberdeenshire, enjoyed the most successful athletics career of the nineteenth century. Over a period of sixty years as a professional athlete, at home and abroad, he ran, hurdled, lifted, jumped, vaulted, threw, boxed and wrestled his way t0 around 10,000 victories. He once won twenty prizes in one day at a Highland Games. We are hoping to borrow from Aberdeen Art Gallery and Museums a pine sculpture of Dinnie, swathed in his medals, to show in the exhibition, which will be on display when the Scottish National Portrait Gallery reopens its doors again in November 2011. Then we have William Bankier (above; 1870-1949) also from Aberdeenshire (forget Scott’s Porage Oats, there must be something in this Aberdeen Angus Beef). 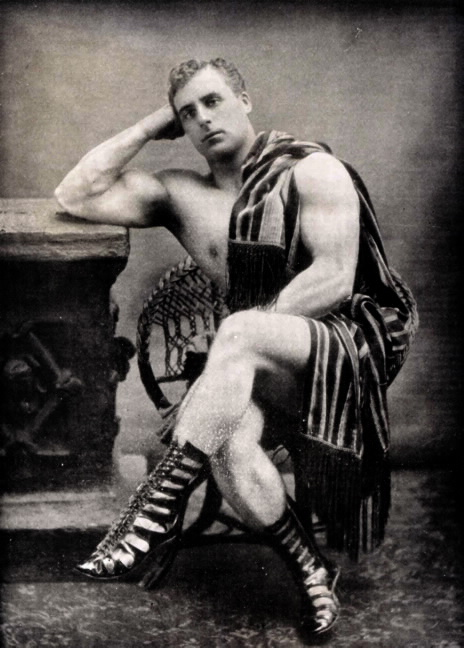 Bankier was known as Apollo: The Scottish Hercules and became the ultimate strongman. In 1900 he wrote about athletic conditioning in his book Ideal Physical Culture, in which he professed: “a cold water bath immediately after getting out of bed is a capital tonic….it must, however, be taken in a common-sense way, and modified to the constitution and state of health of the bather” (Bankier’s advice came 104 years too late for Robert Burns). Launceston Elliot (1874-1930, flexing to the left) completes this trio of Scottish strongmen. 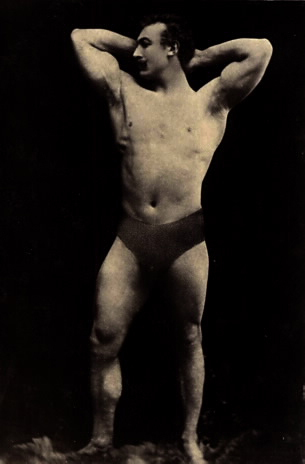 Elliot was Britain’s first Olympic gold medal winner – he weightlifted his way to glory in the first modern Olympic Games of 1896 in Athens, in the one-handed lifting event. The visual imagery associated with these three athletes is extraordinary and I hope to reveal a small part of it within Playing for Scotland. I think I can safely say that there has never been a lineup like it in the Scottish National Portrait Gallery – no Desperate Dan in sight and it won’t be for one night only! Phwoar! Talk about Hotties from History! Enter your email address to subscribe to HEADS UP and receive notifications of new posts by email.